Protect the Sacred San Francisco Peaks! 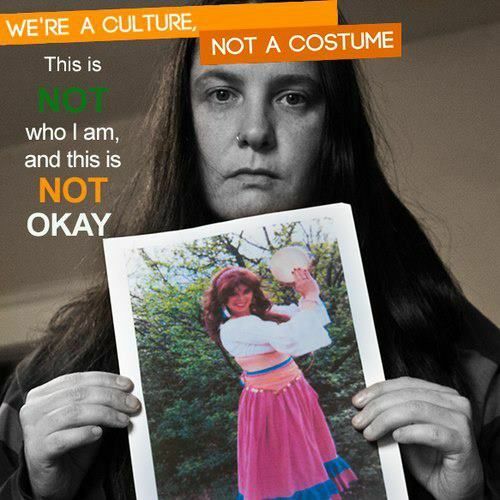 Time and time again, Romani people are the targets of cultural appropriation, with various levels of offenders to tackle. On Etsy, Ebay, and Pinterest combined, one can find over 498,000 objects tagged “Gypsy” which includes items such as dangly jewelry, hippy/Boho skirts, colorful bedsheets, and even pet supplies with tags such as “ Vintage gypsy”, “Bohemian gypsy ”, and “Gypsy Junk” while fashion designers label their companies and collections using comparable terms and are relentless in their use of racially stereotypical themes. There are also appropriators of our music and dance, who name their bands and dance troops using various forms of the term “Gypsy” with not one Romani person to be found among them, such as Toronto, Canada’s “Travelling Gypsy Market” or the Vancouver B.C. based “gypsy performance troupe, Roma Gry” (Gypsy horse). Groups like these escalate their appropriation by not only claiming to be Roma, but are also hired, open to taking educational funds and teaching the public their version of Romani history and culture. This entry was posted in cultural genocide, Decolonization & Unsettling, racism and tagged cultural appropriation, gypsy, gypsy industry, Roma, Romani. Bookmark the permalink. Decolonization ~ Meaning What Exactly? An Indigenous History of "North America"
. Longest Walk 2019 Photos by Western Shoshone Longwalker Carl Bad Bear Sampson. Walkers are in La Junta, Colorado, after being welcomed in Pueblo by KOYC Radio. After walking through the deep snow of Monarch Pass earlier, walkers are now headed to Kansas, on the road to DC, walking for Indigenous rights. U.S. Spy Trucks Target Indigenous on Border. Border Patrol Should Turn Cameras on Itself.
. Now, Saturday afternoon, walkers are at Monarch Pass in the Rocky Mountains. . . . LONGEST WALK 2019 Photos by Longwalker Carl Bad Bear Sampson, Western Shoshone, March 29 and 30, 2019. Those absurd rants about closing the border. Good luck with that. Requesting immediate Support for Dineh Resistance Communities whose livestock are being impounded by Hopi Rangers and Federal Agents. A commentary by Pearl Means telling of future events planned. Reconciliation and Mandatory Indigenous Content Courses: What are the University’s Responsibilities? Cover up: Buzzfeed reveals WWF KNEW locals opposed its flagship park – but hid this from funders. Uhuru News : Resources and destiny of Congo in our own hands! Long live Patrice Lumumba! Long live African martyrs!! As widely reported by international media, former Peru president Alan García died earlier today after shooting himself at home prior to his arrest for allegedly taking bribes from Brazilian company Odebrecht during his presidency. "The Canadian Supreme Court's denial is an affront to the very idea of corporate accountability and a message to anyone seeking justice from corporations responsible for environmental or human rights crimes. It does not, however, grant Chevron any actual victory in the Ecuador matter." The risk of new oil drilling in Achuar territory is more alarming than it has been since I started with Amazon Watch over twelve years ago. Fortunately, the Achuar are determined to protect their lands and families from contamination and they also benefit from the support of steadfast allies, both Peruvian and international. "The Shiwiar, Sapara and Kichwa nationalities of Kawsak Sacha decide to leave the oil in the subsoil and declare their territories intangible in perpetuity, where it is forbidden to extract non-renewable natural resources. The governments in turn must respect this decision." "Justice as such does not exist, especially when the criminal is a transnational corporation and the victims are indigenous peoples, peasants, or nature." Brazil's New President Threatens "the Lungs of the Planet"
If there is hope for the rainforest, and for countries where authoritarians threaten democracy and progressive agendas, it lies in the determination and power of civil society activists like Sônia Guajajara. Protecting Indigenous Lands Protects the Environment. Trump and Bolsonaro Threaten Both. Among the many parallels between their administrations, Bolsonaro and Trump are both taking extreme action to strip the hard-earned rights of indigenous peoples to the benefit of extractive industries and commercial farming. These policies present threats to our communities, the integrity of ecosystems on our lands and the stability of our climate. "A united people will never be defeated!" shouted Maria Betânia Mota, as the indigenous assembly in a partially burned-out agricultural college began. Hundreds of voices roared back in approval. We have eleven years. Eleven years to take bold climate action towards a world not powered by fossil fuels. For our indigenous partners fighting oil and gas extraction on their ancestral territories, there is no time to spare: further expansion of this dirty infrastructure will destroy their land, livelihoods, and way of life. The Shuar Indigenous people of Ecuador's southeastern Amazon-Andean corridor took legal action against the government today in Quito over multiple violations of their collective rights related to the San Carlos Panantza mining project. Bolsonaro Wants to Plunder the Amazon. Don't Let Him. Despite efforts to curb corruption, President Moreno is following the same oil-stained playbook that helped get Ecuador into a cycle of debt and dependency. He has green-lighted new drilling in Yasuní National Park and plans to open up areas in the country's roadless southern rainforest, still hoping that Ecuador can drill its way to prosperity. "There will be an increase in deforestation and violence against indigenous people," said Dinaman Tuxá, the executive coordinator of the Articulation of Indigenous People of Brazil. "Indigenous people are defenders and protectors of the environment."